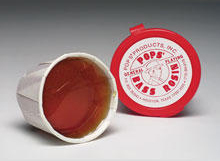 Pops' Bass Rosin is made in Houston, Texas where the rosin is hand-mixed in small batches for high quality control and clear purity, packaged in an ecology-proof box and sold by weight -- 1.13 oz per cake. For over 35 years, it has been distributed to bass players worldwide! This small family business keeps all precision factory equipment up-to-date to enable the original "recipe" to be adhered to exactly so that quality control is not compromised in any way. This assures that the rosin maintains the original characteristics that makes it such a popular rosin among bass players. The rosin is very popular worldwide because it has unique qualities that enable the bow to really "grab" the string and make a very pleasing sound.